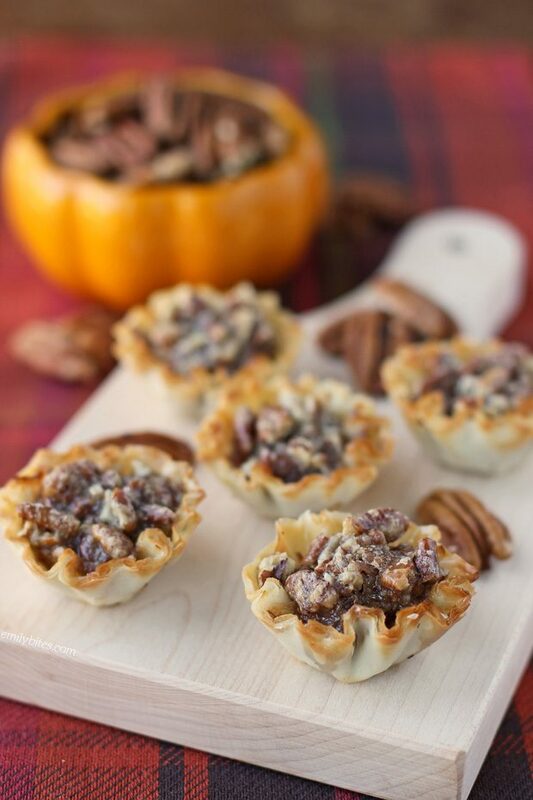 These easy, lightened up Pecan Pie Bites are a great way to indulge in the flavors of one of your favorite Thanksgiving desserts without adding too many extra calories to your holiday meal. Perfect for friendsgiving celebrations or for the big day, these sweet, decadent mini tarts are perfectly sized so you can always squeeze one in (even if you filled up on turkey). Better still, these treats take just a few minutes of prep time and bake in just 10-12 minutes – it couldn’t be easier! 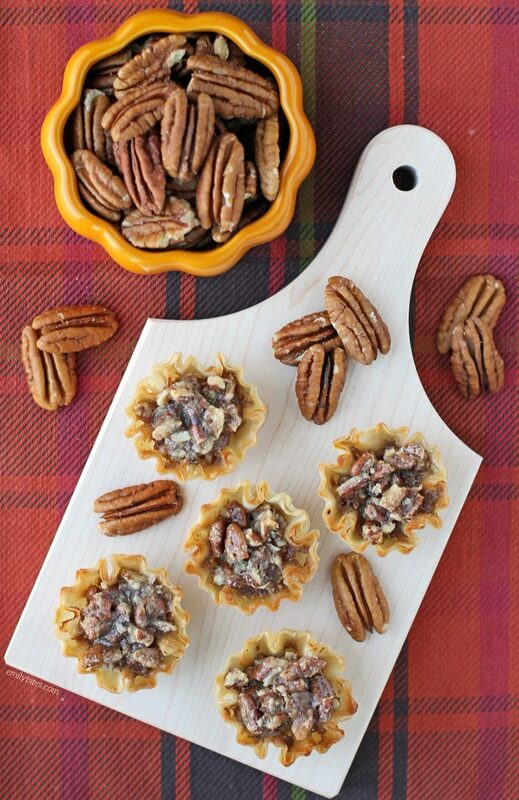 The flaky, crunchy phyllo shells with the sweet, nutty pecan pie filling are sure to be a crowd-pleaser at your holiday celebrations and you can rest easy knowing they’re each just 58 calories or 2 Weight Watchers SmartPoints! Looking for more tasty, healthy Thanksgiving recipes? I’ve got you covered! Head over to my round-up of The Best Lightened up Thanksgiving Recipes. I’ve got side dishes, desserts, appetizers, breakfasts, and each recipe includes nutrition information and Weight Watchers points to help you navigate the holidays while sticking to your goals. In a mixing bowl, combine the pecans, brown sugar, half and half, vanilla and salt and stir together until well mixed. Spoon the pecan mixture evenly into the phyllo shells and place the baking sheet in the oven. Bake for 10-12 minutes until the edges of the shells start to turn golden and the filling is heated through. I want to make these for a friendsgivingthe night before, do they need to be refrigerated and what’s the best way to store them overnight ? I just left them out on the counter overnight and they were great the next day! I can’t wait to try these for next week. I was thinking ahead for my meal for Thanksgiving and didn’t want to use 18 pts for pecan pie. But I think this is awesome. Thanks Emily.. THESE ARE FABULOUS! They are so fast and easy, it’s almost criminal to say you made them! Hahaha. Thank you, thank you, thank you for a 2 Smart Points (!!!!) dessert option. My husband can’t believe how fast I whip them up and how tasty they are. Who doesn’t love pecan pie? They almost taste like bacalava from a popular Mideastern restaurant in town. Delish! We are also enjoying several of your other recipes! Great job! This is great! I bought the wrong phyllo dough — I bought the long sheets instead of the mini shells. Ended up cutting them into 12 squares and putting them into a mini muffin pan (similar to making your wonton cupcakes) and it turned out fine! Thanks a bunch! Happy Thanksgiving! These are SO good! Loved being able to indulge in my pecan pie without blowing my points! Thanks Emily!! I made these today. They are SO GOOD! Thee best. I ate to many of them. This is the BEST recipe ever! My favorite pie is a pecan pie, and now I can eat this instead and not feel like I just consumed my full week of Smart Points 🙂 This was a huge hit over Thanksgiving with my family and plan to make them again for Christmas. Thank you Emily!! Hi! I didn’t have pecans on hand so I used slivered almonds. They turned out great and reduced the point value to 1 point per tart. These are to good. I am never making a full recipe again because I have no control with these and last time I made a 1/2 recipe and I made sure my friend was here to help me eat them. Made these for Thanksgiving today!! They are delicious!! and so easy to make!! I’ve made these a few times and they were great. Today, they were so dry. I swear there was an egg and 2 tbs of honey in here before. Am I wrong? Thanks for including the WW values in your recipes. Now I can have some guilt free desserts that are not “mass” produced and sold in the grocery store. I’ve asked to be placed on your email list; so I look forward to future WW friendly recipes.